I have been posting a lot of ideas for the garden using items found in the store. 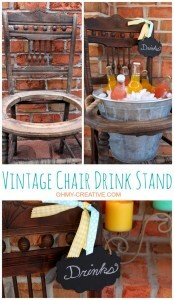 Today I though I would give you another idea for beautiful cane chairs missing the cane seat. How is this for an ice chest for your next gathering? How cute is this? No mess, no fuss & best of all, easy clean up! Have an awesome day, and please share pics of your unique ice chest!